"Help me, help me, sweet Jesus, help. I'm going to die." 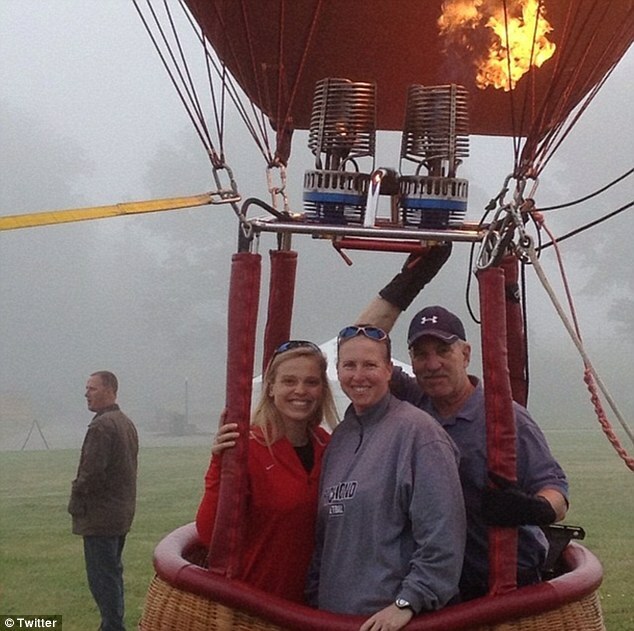 Natalie Lewis, 24, Ginny Doyle, 44, and a still-unidentified pilot died when a hot air balloon burst into flames shortly after takeoff on Friday night near the University of Richmond. Horrified onlookers heard the women screaming for help as they desperately jumped from the basket to escape the flames. "Help me, help me, sweet Jesus, help. I'm going to die. 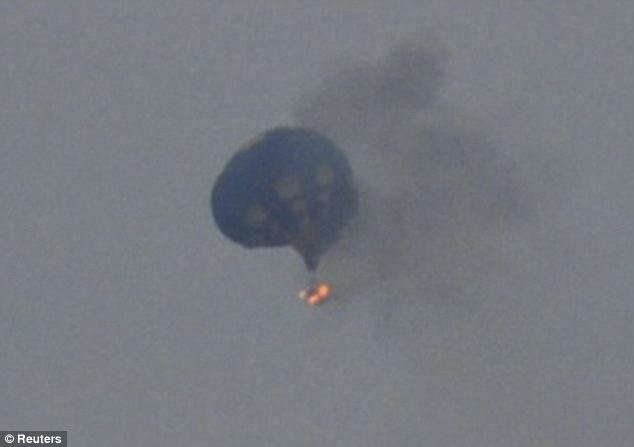 Oh my God, I'm going to die," witnesses reported hearing one of them scream as the gondola and balloon separated. Jesus did not perform a miracle to rescue the woman as she cried out to him. Why not? Google search featured a blog entry where Google user and atheist Tessa Schlesinger asked this very question. She's been flooded with support, condemnation and (of course) explanations from religious who claim to know the answer. "...I believe some people are more "God-obsessed" and angry - and so willing to be nasty about faith that they lose the compassion that even non believers have. No offense to you sir. It is a tasteless comment on a horrific death of 3 human beings. It is also notable to me that this person who cried out in sheer terror as her life was ending is probably in the presence of the God she cried out to. I feel badly for the families in mourning." "Atheists often wonder why they are viewed negatively. For my part, it's because they can't resist saying "where's your Messiah now, eh?" when tragedy strikes." "I have had many a prayer unanswered in my life so far and I still believe that God exists and that he is good. Why? Because he always comes through in the end even if it's in a way I don't expect. God promises to hear prayers and he says that he will answer them, but you're missing the whole point! The point of "If you ask my father for a fish, will he give you a stone?" is not that God will give you exactly what you want every single time. If that were true, our lives would be a complete mess. What Jesus meant by that example is that God gives good gifts to his children when they ask, and sometimes we have to go through hard times in order to receive them and fully appreciate them. Indeed, God works in mysterious ways, but he promises to bring good to those who love him and he never leaves us without instruction." "Wow! I came to a different conclusion. I was thinking of all the people who die tragically and how few times I hear of them crying out to God or Jesus in that moment. Here is a victorious woman who probably loved God dearly. She was ushered in to Gods' presence because of Jesus death for her. It is much more tragic to be facing death and having no one to cry out to but yourself. We all die eventually. You should read "Foxes Book of Martyrs" and see the incredible miracles of people being burned alive and praising God until their body fell apart in the flames. God be with the friends, family and students as they say goodbye. I will remember this cry to Jesus, our only hope for forgiveness." Shoulda prayed to Joe Pesci. Woulda been just as useful. "I must say that the "comment" smacks tasteless, unnecessary, and fundamentally inappropriate within the context of the dying moments of those individuals. But then it is your prerogative to comment as you see fit. That said, it would appear that your "comment" showed more desire for opportunistic expression and exploitation of a tragedy. Not enlightened humanism. It displayed a great unwillingness to consider that "sometimes" that which we cannot see or explain within our own selectively skewed purview (be that out of conviction, indoctrination, academic enrichment, ignorance or simple obstinance) can still ring true for some but not others. Human compassion and love were nowhere to be found. An individual calls on the Lord and some earth bound observer always has to take issue with it from an "enlightened" "on high" perspective. The death of an individual who cry's out for help does not disprove that the God of the Bible is "incapable" or "absent" or "insufficient." Nor does it technically prove anything "on face value." It is within the overarching intention and framework of scripture examined "within appropriate context," along with faith and belief as a result of personal experience that one comes to understand that there "just might be" something beyond the supposed self sufficiency of strict rationalism or blind denial. Still others might come to an opposite conclusion. And that's fine. Unfortunate, but fine. I am a scientist, but from 'my experience' all is not "science," if you will, and science is not all." Obviously some other 'christian' either had a stronger faith or prayed more fervently that they wouldn't be save. Concluding, prayers are in fact answered. Tessa Schlesinger claims she was simply asking a legitimate question. Even if taken at her word, was this done in poor taste? Do you think Schlesinger accomplished anything positive in starting a discussion this way? Ari - yes, it's a good question. I think that nobody should be afraid of good questions. Another questions, why is God ever present in our every day commodities but working in mysterious ways when one actually need help? when you ask your father for fish he will not give you stone? your father in heaven knows how to give good gifts. she asked for life and god gave her death. you will be utterly ignorant to think death is a good gift, god! hey god! come back here. i need answers! yeah right. He didn't perform a miracle because it was being filmed. That 1 invention killed all his power. Because He ONLY works in mysterious ways, not out in the open where you can observe Him. Maybe god was busy with a failed attempt to get Tim Teebow drafted back into the NFL or maybe he needs to figure out who should win an Oscar or Emmy. In any event fog, power lines and balloons are a bad mix. There was no need for god in this case. They just needed somebody reasonable enough to suggest the conditions are not OK for a balloon ride near high tension wires. He was probably busy planning The Cleveland Indians defeat by the statistically worse Tampa Bay Rays last night and didn't notice three people being roasted alive in a balloon. Got to prioritize, you know. I feel what I am strong enough to feel, and use my mind to avoid feeling what I am not strong enough to feel. PERIOD! Or, as England's folk shout, FULL STOP! The only thing that could possibly render Tessa's comment in poor taste is the fact that it concerned a senseless tragic disaster. Her logic is spot on though. I'm surprised they're still allowed to build these balloons out of flammable materials, given that flying a balloon involves an open flame generating a lot of heat. In particular, since these victims apparently perished by being burned to death in the gondola, WHY are they still building them out of kindling (wicker)? It depends on how, if you take the religious viewpoint, God has set up the universe. It's possible that He set it up to run its course more or less naturally, since it wouldn't really work if any of us could just wish things to happen in our own particular sweet way. Professor Robert pointed this out and I think he's right. However if God is a moral God, He would help us in our efforts to be more moral. This isn't beyond the bounds of logic or reason (if you accept the existence of God). Therefore, just flying in a burning hot-air balloon wouldn't qualify you for divine help. In other words, getting killed by accident isn't a moral issue. Morality concerns how human beings treat each other (and other living beings).